You'll have to wait a little longer than expected to see how your hands work as lightsabers. The release of Kinect Star Wars, originally due in "holiday 2011," has been pushed back until after Christmas by publishers Microsoft and LucasArts. The R2D2/C3PO-themed Xbox hardware bundle which was set to be released with the game will also be delayed until the game ships next year. Speaking to the Official Xbox Magazine, a spokesperson for Microsoft said that they want the game to "realize its full potential" on release. He added that the company will announce a new release date "at a later date." All things considered, this move is probably a wise one. When Susan Arendt tried out the game's Bespin level at E3 this year, she found that the controls were still lacking in responsiveness and finesse. 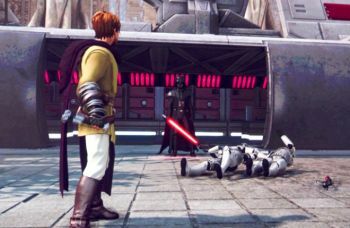 Hopefully this additional development time, however long it turns out to be, will give developer Terminal Reality the opportunity to iron out any problems and ship a game that lets you use the Force with less of an emphasis on flailing.